It is by far one of the most fun and successful fundraising events for Orchard Place. Orchard Place, mental health experts for Iowa’s children, is proud to announce the third annual Moonlight Classic ride Saturday, June 14th. Registration and check-in begins at 8:30 p.m. with the bike ride beginning at 9:30 p.m. at El Bait Shop, 200 SW 2nd Street, Des Moines, IA. Last year, more than $70,000 was raised with the help of ride sponsors and 600 cyclists. This is the third year Sammons Financial Group has served as the Presenting Sponsor of the event providing a generous contribution to Orchard Place. It is by far one of the most fun and successful fundraising events for Orchard Place. Proceeds go to help more than 8,000 children with mental health issues in Iowa. The 10-mile night bike ride through the streets of downtown Des Moines features a new route this year with fantastic views of the city and numerous local attractions including: Gray’s Lake, the Pappajohn Sculpture Park, the World Food Prize Hall of Laureates, The Simon Estes Amphitheatre, the East Village neighborhood, the Iowa State Capitol, Center Street Pedestrian Bridge and the new Des Moines Social Club. Prizes will be awarded for: best bike lights, best helmet lights, best costume, best team bus, and biggest team. A live band and food vendors follow the event for an exceptionally fun night out. 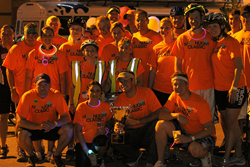 To register, volunteer, or learn more about the event, visit http://www.moonlightclassicdsm.com. Sammons Financial Group, Inc. (SFG) is the parent of a group of member companies under the insurance Holding Company Act made up of several successful financial services companies offering a variety of financial and retirement products through multiple distribution channels. The ultimate parent of SFG, Sammons Enterprises, Inc. is a diversified international holding company that owns and operates businesses across a range of industries. Headquartered in Dallas, Texas, Sammons Enterprises, Inc., ranks among the largest privately owned companies in the United States. (Ranked No.123 on Forbes’ 2013 List of America’s Largest Private Companies. The list includes 224 closely held corporations that had sales of more than $2 billion.) The member companies of SFG include North American Company for Life and Health Insurance®, Midland National® Life Insurance Company, including its divisions, Sammons Annuity Group and Sammons® Corporate Markets Group, Sammons Securities Company®, LLC., Sammons Retirement Solutions® Inc., and Sammons Financial NetworkSM LLC. SFG offices are located in Chicago, IL, Fargo, ND, Sioux Falls, SD, and West Des Moines, IA. Orchard Place is the oldest locally-based charity in Des Moines providing mental health treatment and expertise for Iowa’s kids. Our inpatient, outpatient and community program serves nearly 8,000 children from birth to age 22 annually. Four operating divisions work under the Orchard Place umbrella of services: Child Guidance Center, Orchard Place Campus, PACE Juvenile Center and the Integrated Health Program. More information can be found at http://www.orchardplace.org.